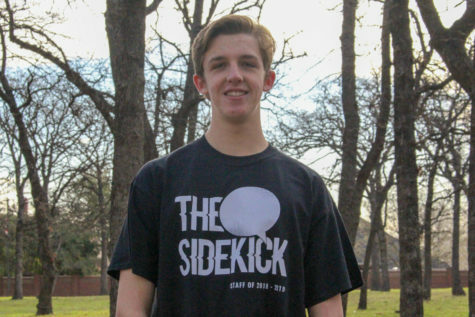 RICHARDSON – When Coppell senior quarterback Brady McBride threw a pass to senior tight end Reese Walker in the end zone for the final touchdown of the first half, the Coppell Cowboys football team was on its way to a 59-20 victory over Richardson Berkner on Friday night at Wildcat-Ram Stadium. The victory clinches a playoff berth as Coppell improves to 7-1 overall and 5-0 in District 9-6A. From the start, the Cowboys had control over the game. Not even a minute into the game, McBride connected with junior receiver Blake Jackson for a 40-yard touchdown to gain an early lead of 7-0. A 44-yard field goal by junior kicker Caden Davis then put Coppell at a 10-0 lead to end the first quarter. Much like last week’s victory over the W.T. White Longhorns, the Cowboys showed once again that there is depth in their lineup. Many second teamers or players who usually do not get as many snaps as others had the chance to shine. The Rams (2-6 overall, 1-4 in District 9-6A) were contained throughout the game by the Cowboys’ defense. The Cowboys forced four fumbles, recovering all of them. Coppell Cowboys junior wide receiver Jonathan McGill recovers a fumble giving the Cowboys an advantage during the first quarter of the game on Oct. 27 at the Ram-Wildcat Stadium. The Coppell Cowboys defeated the Berkner Rams with a final score of 59-20. On the offensive side, McBride threw for 154 yards, giving the Cowboys five touchdowns. “Tonight was big, we came out fast in all phases of the game and we should keep doing that,” McBride said. 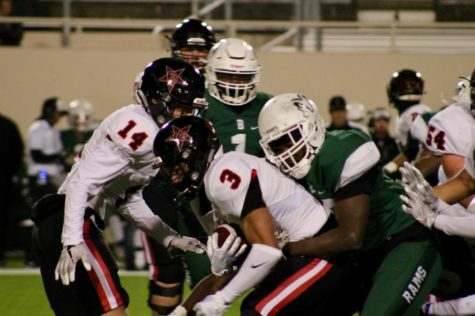 On Berkner’s offensive side, the Rams often utilized their star running back, Fahez Yusuf, as they ran their offense. However, Yusuf was held to 33 rushing yards. Berkner’s primary strategy was a run-option with their quarterback, Nickel McLemore. Its run-option consisted of McLemore and Yusuf both rolling out to the same side and McLemore had the choice of either keeping it or tossing the ball to Yusuf. However, its strategy backfired when Yusuf fumbled the ball on the toss in the second quarter, recovered by the Cowboys. Going into the playoffs, as well as the remainder of the season, the Cowboys plan to keep using the same offensive and defensive tactics that have been working for them all season. These consist of maintaining a versatile offense and a pressuring defense. By being versatile in their offensive play, the Cowboys create multiple threats and, by sheer numbers, opposing teams cannot defend against a quarterback, multiple receiving threats and a running back all at the same time. This creates leeway for Coppell to have a choice of play to the run, instead of being forced to one particular strategy. For defense, there will often, if not always, be a Coppell defender on the tail of the quarterback. This forces the quarterback to throw a quick pass, if at all. The Cowboys play the Skyline Raiders on Friday at 7:30 p.m. in Dallas.